Universities of Applied Sciences (UAS) are not included in worldwide university rankings, which are largely based on research journal publications. The Netherlands has a binary higher education system, and unlike, for instance, the UK, it differentiates between ‘pure research’ universities, and ‘applied science’ universities, such as Wittenborg. Although UAS institutes often carry out research, this is not on the scale or focus that research universities do - hence the exclusion from world rankings. However, in the Netherlands, there are currently three points-based national ranking systems that do include universities of applied sciences: the ‘Keuzegids HBO’, the ‘Elsevier Magazine’ and ‘National Student Survey (NSA), are all published on a yearly basis to help students select the right programmes and schools for them. ‘The ’Keuzegids’ is the independent guide, published yearly by the Centrum Hoger Onderwijs Informatie (Higher Education Information Centre). One of the five published reports (HBO), critically assesses and compares the quality of study programmes of applied science universities in the Netherlands. Results take into account the perspectives of both students and the universities themselves. Rankings are based on data about the programme’s success rates, expert opinions from the accreditation of programmes, and student feedback derived from the NSA results. In 2018, Wittenborg was ranked 4th best small University of Applied Sciences and its Bachelor of Business Administration programmes were ranked 2nd in the Netherlands. In the 2017-2018 NSA students gave Wittenborg’s general study programme an impressive 8.08 out of 10 – up considerably from the 7.17 of last year. The national average is 7.94 out of 10. Wittenborg University of Applied Sciences is appointed by the Dutch government and meets all required regulations. All degrees and programmes are internationally recognised and accredited in Europe. Programmes have been developed in consultation with, and have the support of business and industry. Master of Science Programmes are accredited by the University of Brighton (under QAA, UK). Bachelor of Business Administration Programmes are accredited by the Netherlands Accreditation Organisation (NVAO) and the Foundation for International Business Administration Accreditation (FIBAA - a German, Austrian, Swiss accrediting body). Bachelor of Entrepreneurial Business Administration is accredited by FIBAA. Master of Business Administration programmes are accredited by NVAO and FIBAA. "Our unique learning environment provides students a learning experience that goes beyond the traditional values of a business school. When you join Wittenborg you are admitted to a family of entrepreneurs that sees good business practice as an art, something to be nurtured. Join Wittenborg and you enter a world in which you can develop, and build on your leadership decision-making skills." Wittenborg is Apeldoorn's International University of Applied Sciences, a government-appointed institute, founded in 1987. The institution's most important goal is the integration of theory and practice in higher education through combining practice and applied research. This can still be seen as the most important drive behind Wittenborg’s education, leading students to a solid base on which to build a successful and exciting career in the future, with secure prospects. Practice and theory in the real world cannot be separated, and it is this combination of study that makes the higher education provided by Wittenborg such an exciting and challenging prospect for students both from within the Netherlands and abroad. Wittenborg has excellent contacts with business and governmental organisations, sourcing teaching staff and placement opportunities in these fields. Wittenborg guarantees students good networking possibilities, both within the classroom and outside! Wittenborg University is not government funded, however, it is recognised by the Netherlands government as an Institute for Higher Education, and operates as a non-profit organisation. Wittenborg therefore receives no direct funding from the Dutch government, however, it is an institution with the right to award officially recognised degrees and legally protected titles to graduates of their accredited programmes. Government approval is official recognition that the quality of Wittenborg University has been inspected and approved of. 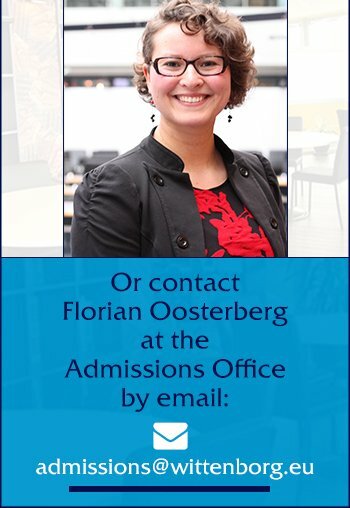 The result makes Wittenborg University in Apeldoorn, Amsterdam and Vienna the perfect choice!